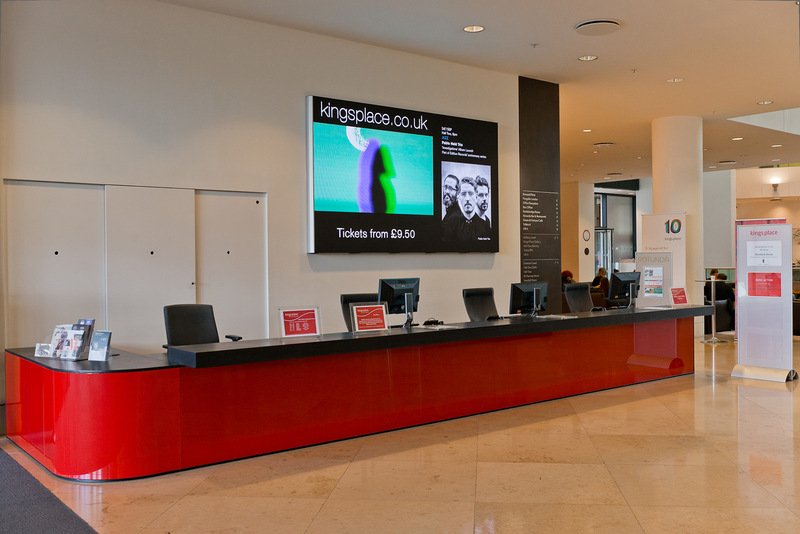 Kings Place is an independently-funded arts and conference venue in the heart of Kings Cross. Their programme is as diverse, engaging and innovative as the city it’s based in. 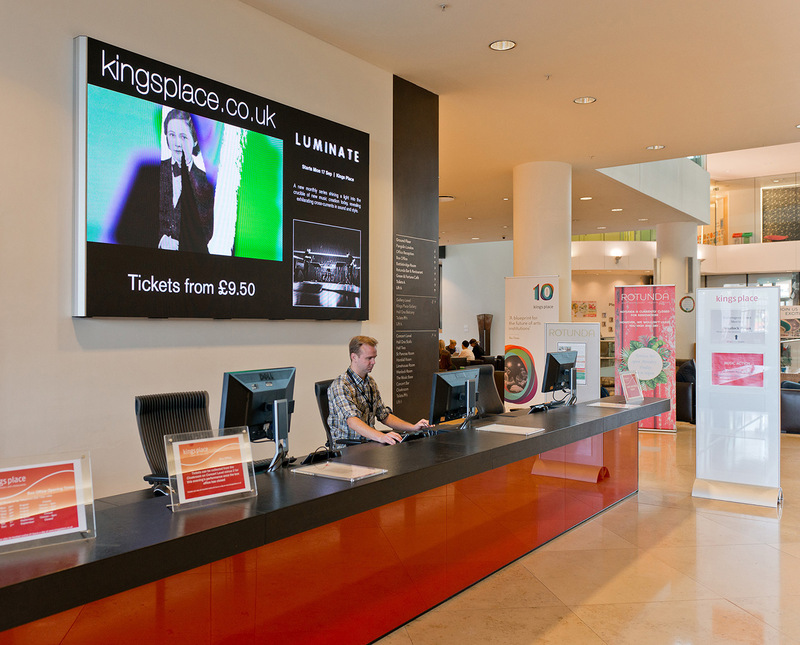 Kings Place provide a diverse offering of music, spoken word, festivals, comedy and visual art. 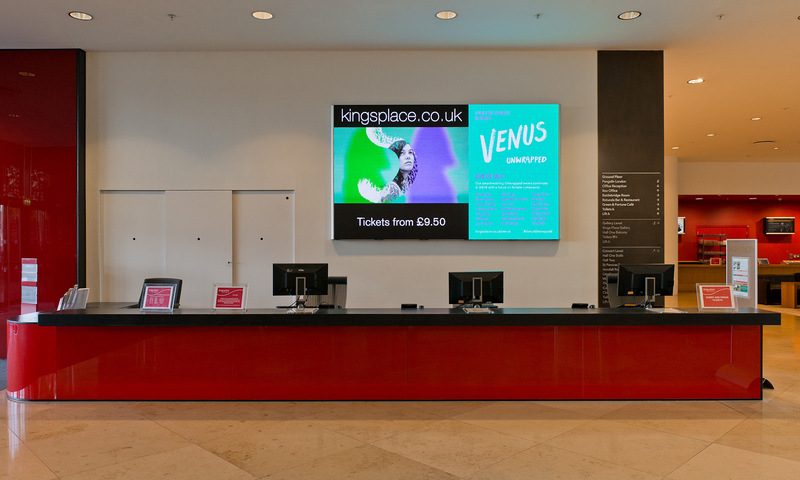 Eclipse Digital Media began working with Kings Place in 2014, where the initial requirement was to migrate from an existing digital signage platform to a new, technically strong and feature rich platform. 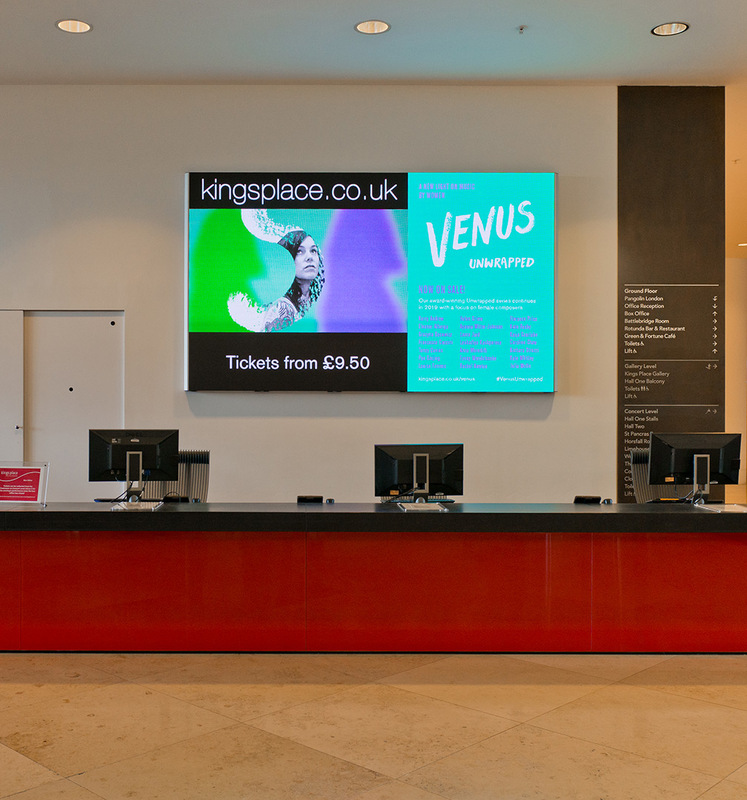 Over a period of ongoing consultation consisting of various on site meetings, product demonstrations and phone calls, Kings Place were able to identify their digital signage requirements clearly and outline exactly what was most important to them in terms of the new system and display solutions. 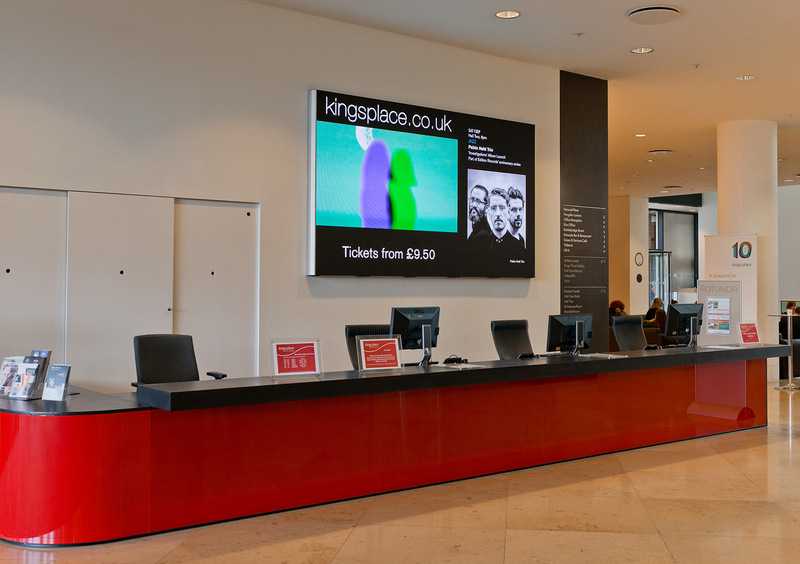 Kings Place required an on-premise signage solution with the ability to support live network broadcast streams from events. 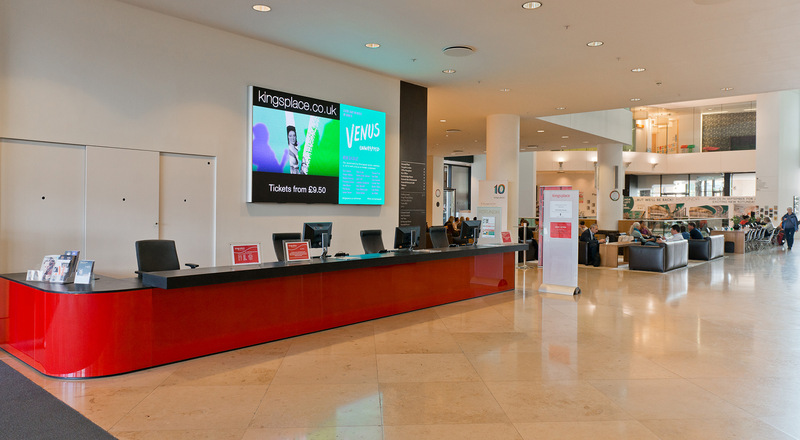 They also wanted a ‘big impact’ signage solution for their reception space to replace the manual wooden boards. 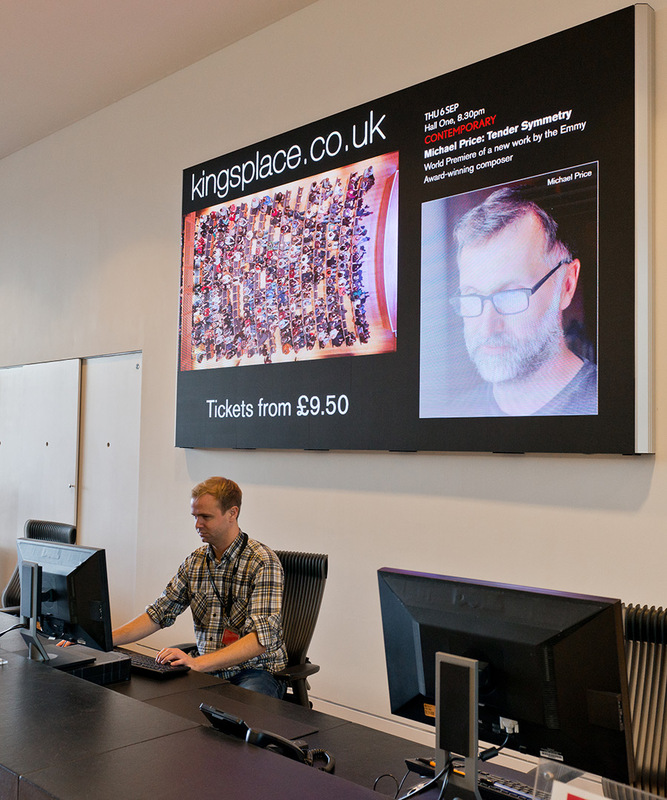 After a consultation period and various product demonstrations and evaluations, Eclipse Digital Media helped Kings Place to settle on using a ONELAN digital signage system. This system includes an on-premise Content Management Server (CMS) along with a number of Subscriber NTBs some of which include stream-in licenses to decode and display UDP streams broadcast on the Kings Place network. 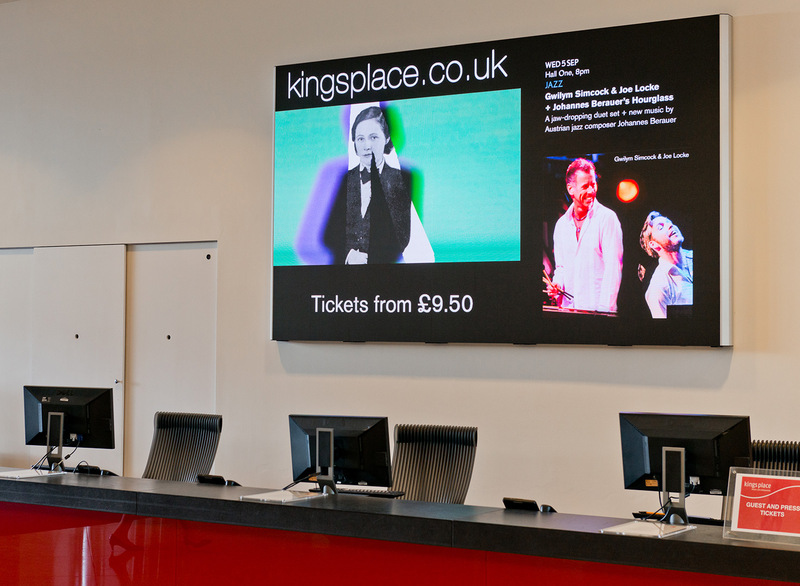 The subscribers are connected to various displays around the building utilising the existing screen hardware available. 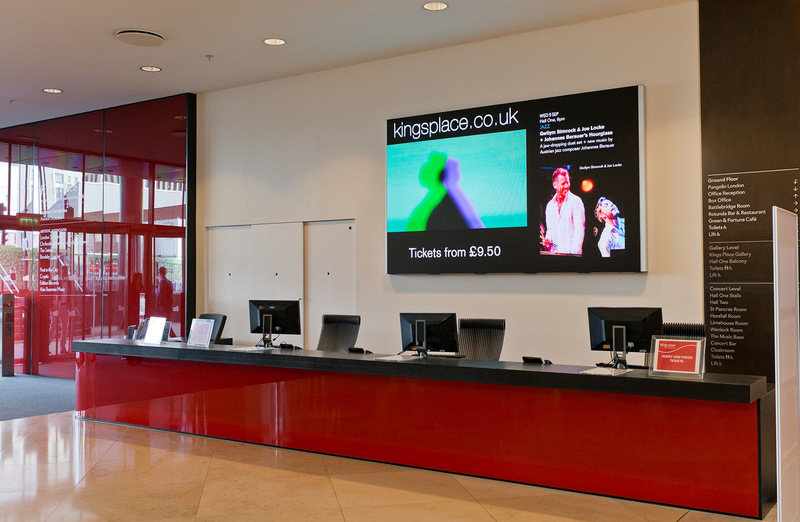 Initially Kings Place specified a video wall requirement for the Reception area to deliver their ‘big impact’. 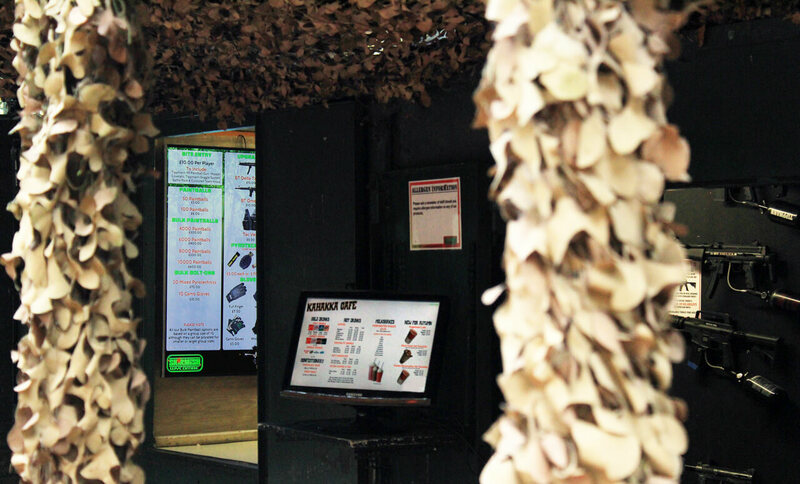 With the dimensions available and desire for making a maximum impact to visitors, Eclipse Digital spent time proposing a variety of video wall solutions along side an LED Narrow Pixel Pitch Video Wall. 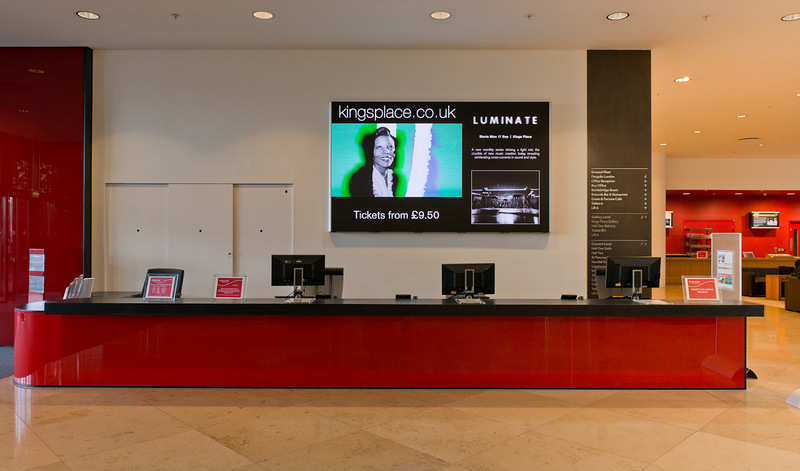 To help convince Kings Place LED was the right product for them, Eclipse Digital worked with PSCo to arrange an on site demonstration day where a 3.2mm and 2.4mm pixel pitch Absen LED panels were set up and Kings Place staff were invited to view and examine in detail. 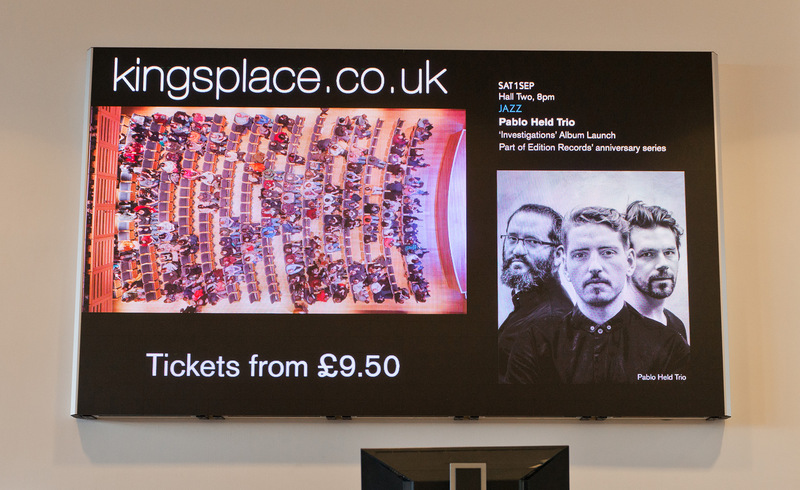 After this demo day, Kings Place agreed LED was exactly the right product and opted for the 2.4mm pixel pitch LED panels. The solution installed was 30 Absen N2 panels covering 2.8m x 1.73m and offering a resolution of 1200 x720. 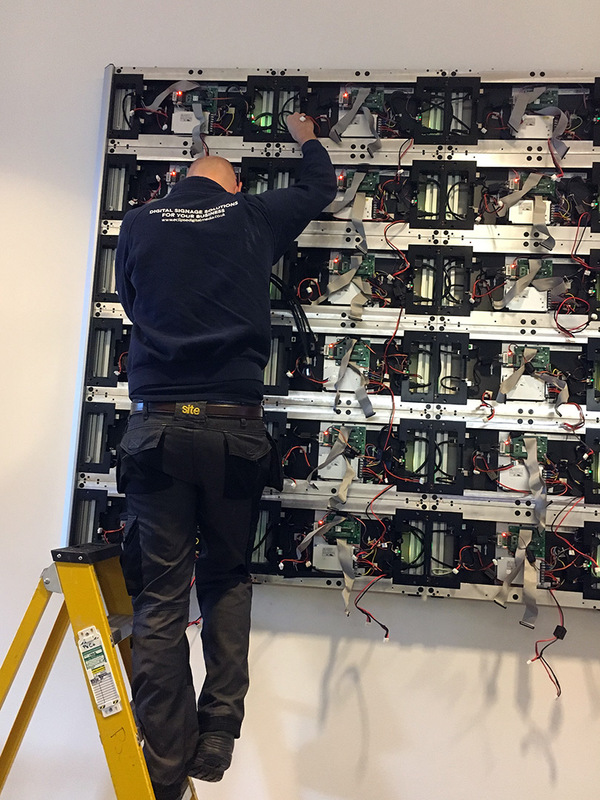 This was installed with a bespoke mount and side framework, along with a light sensor to automatically modulate the brightness of the LED. 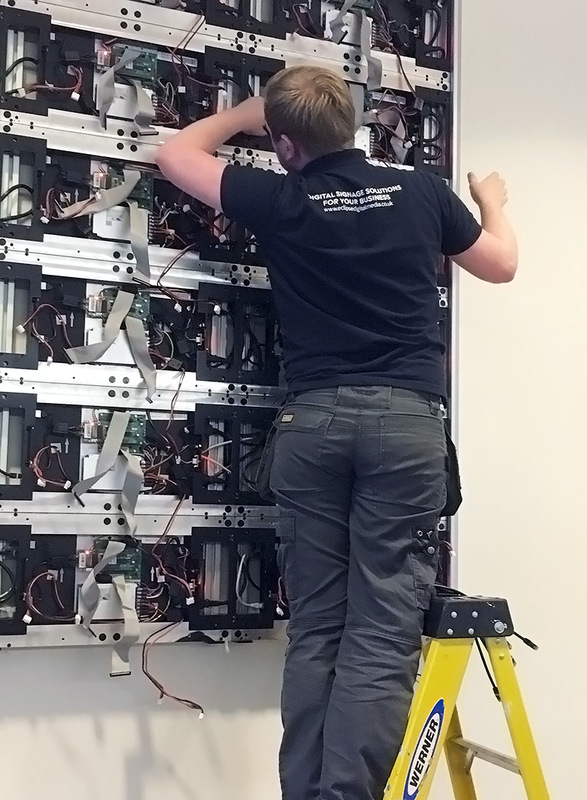 Eclipse Digital Media installed all the controllers, remote management computer, digital signage player and light sensor kit within a wall mounted data cabinet in an alcove area behind reception. 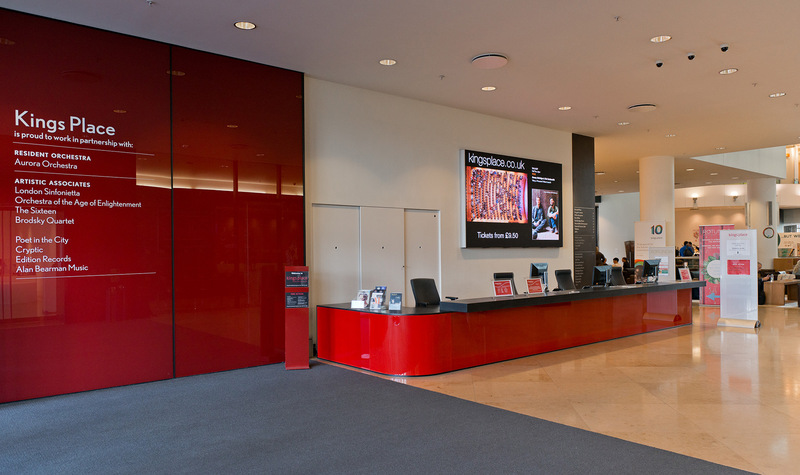 Eclipse Digital Media also manufactured and installed the alcove door system with integrated light sensor. 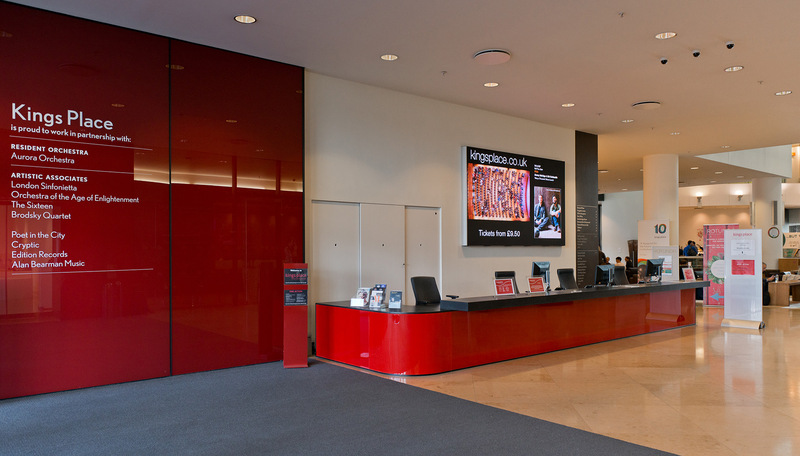 “When we opened doors in 2008, the original design team had implemented a digital signage platform already. 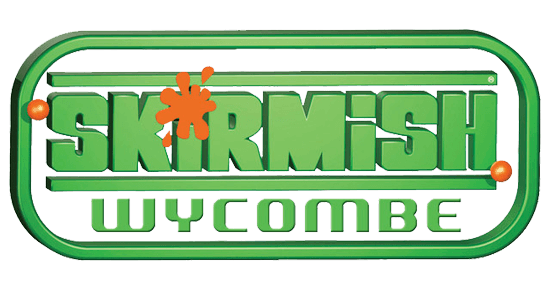 Although at the time, this system proved to be okay, technology in this area of the market was growing rapidly and it became obvious that the Windows based system was soon becoming outdated and unable to support modern video codec standards. As part of our review into potential replacement platforms, we spend time at conferences such as ISE in Amsterdam to compare the market in which more modern Linux based systems were becoming more common. 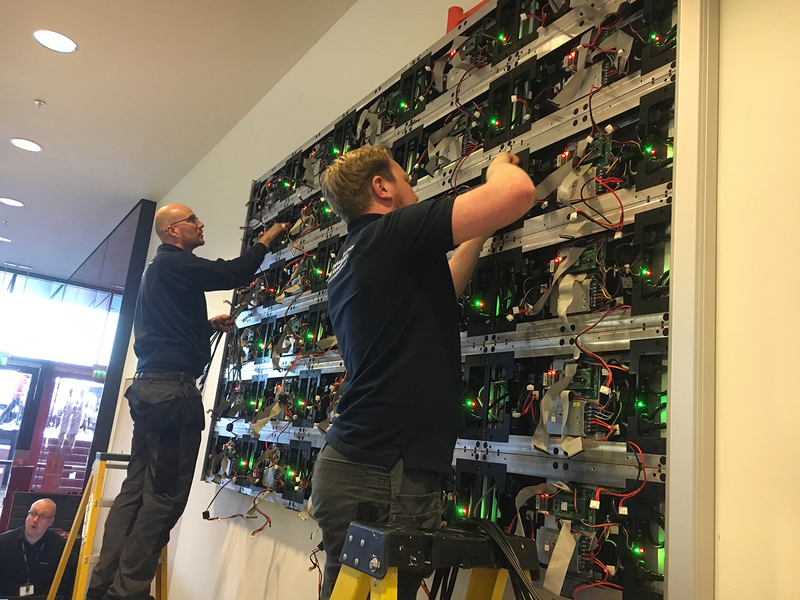 We first met Eclipse Digital Media when one of our companies, Green and Fortune were looking for a retail screen for their new events space for their new head office within the venue. Through our experience working with Eclipse, along with our growing relationship with Chris Wood at ONELAN, we opened discussions about the possibility to migrate our signage system to ONELAN in phases. Eclipse Digital presented expert knowledge with the ONELAN solution and understood our requirements and objectives perfectly, as such we soon progressed with a partial introduction as a proof of concept. This proved very quickly to be the right solution and we decided to replace the whole of C-Nario with ONELAN and never looked back. 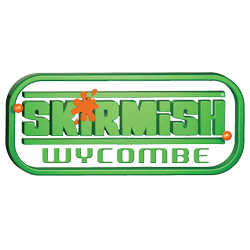 Skirmish Wycombe‘s premier 16 acre paintball and outdoor activity centre offers a wide variety of play areas and scenarios with up to 30 players per game. 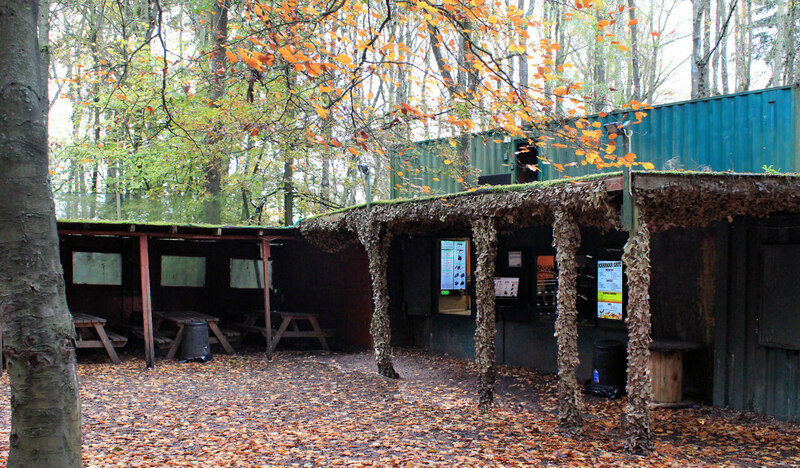 Laser Tag and mini paintball options are also available to cater to all audiences. 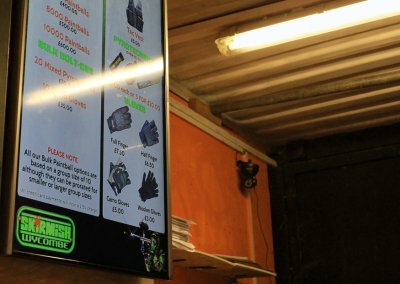 “We have always used printed information boards for our Cafe and Paintball Shop but when looking at different options, digital menu boards where the best choice for us. 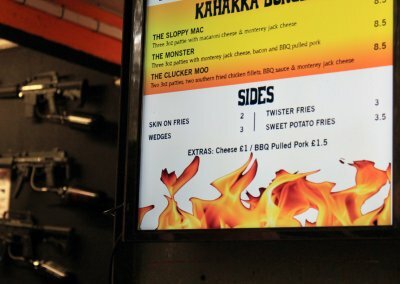 With displays already in place, Eclipse Digital provided small form factor Digital Signage media players. 2x Android Mini PC sticks and 1x Intel® Compute Stick paired with cloud based digital signage software embed signage. 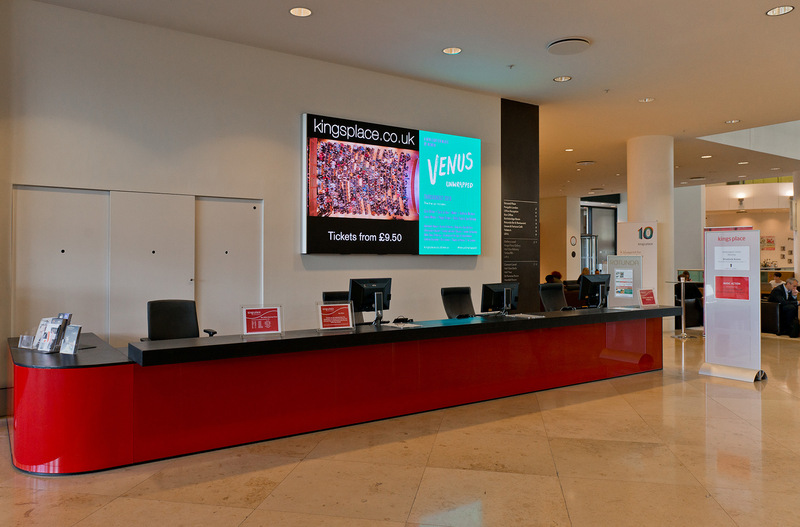 embed signage was selected as the Digital Signage software of choice due to a number of factors. 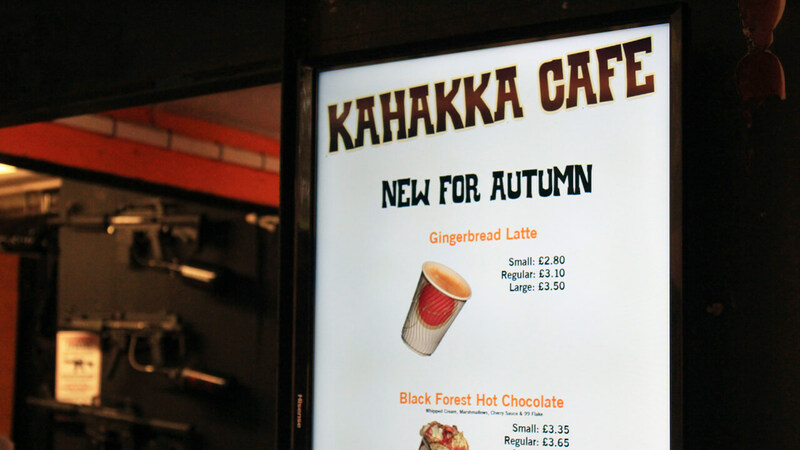 Hardware flexibility, intelligent playback, remote updating, affordability and an easy-to-use layout builder made embed signage a clear contender. 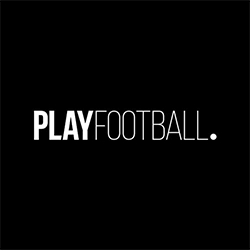 PlayFootball operates thirteen new generation small sided football centres under the PlayFootball brand and are holders of the coveted FA accreditation for small sided football brands. Each PlayFootball Centre receives over 2,500 individual player visits per week, 30,000 plus across the group per week, that’s 1.5 million plus individual visits per annum. 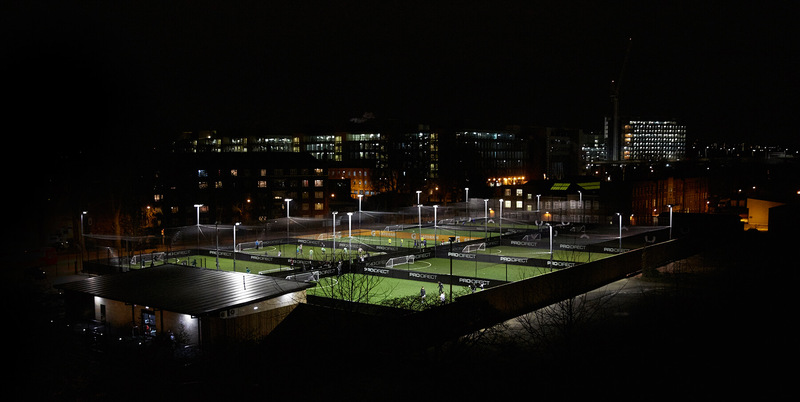 PlayFootball has developed a strong pipeline of sites using the land partnership model. It is a brand with a passionate aim: to get Britain playing football. 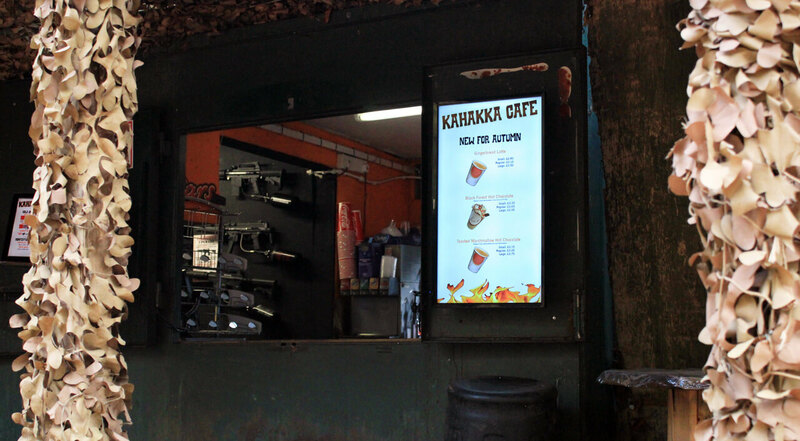 PlayFootball wanted to update their customer communication methods and saw digital signage as the right option. They wanted the ability to deliver brand offers to customers as well as key partner promotions. 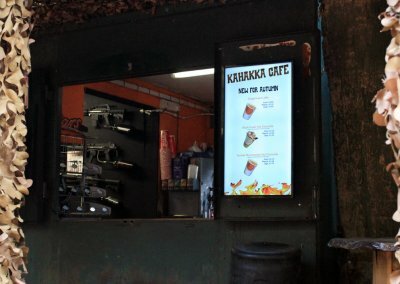 A key element of the solution was to have the ability to display live sport through the signage system and schedule content to play at different times of the day and at different locations. 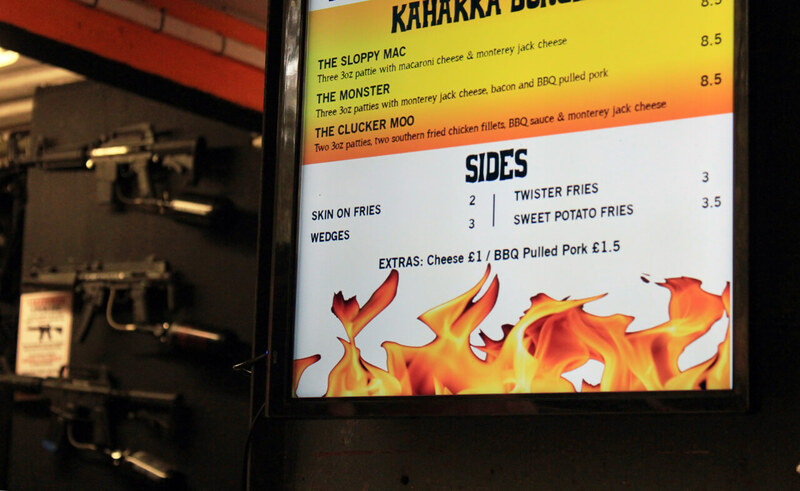 Eclipse Digital Media provided a ONELAN digital signage solution with the ability to take inputs from external HD sources such as Sky TV. Using the ONELAN digital signage network, Eclipse Digital provided PlayFootball with all the necessary tools required to meet their communication objectives. This solution allows them to schedule different content to play at different times of the day, play unique content at each location, switch between brand and key partner communication and live sport fixtures as well as being to update content instantly. 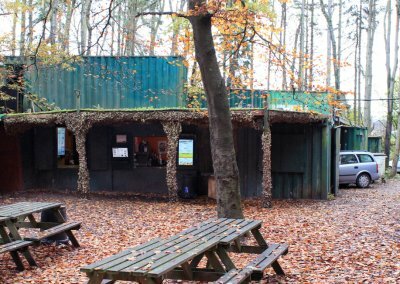 Knowsley Safari is a zoological park and tourist attraction in the Knowsley area of Merseyside, England. 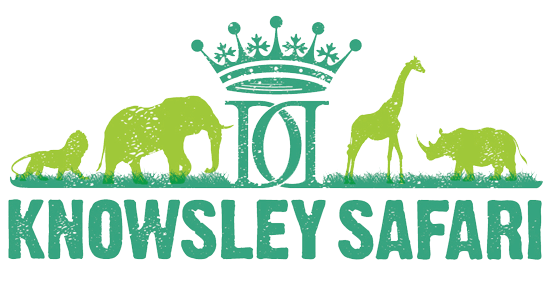 Knowsley Safari contributes to conservation and research through links with conservation projects and universities. 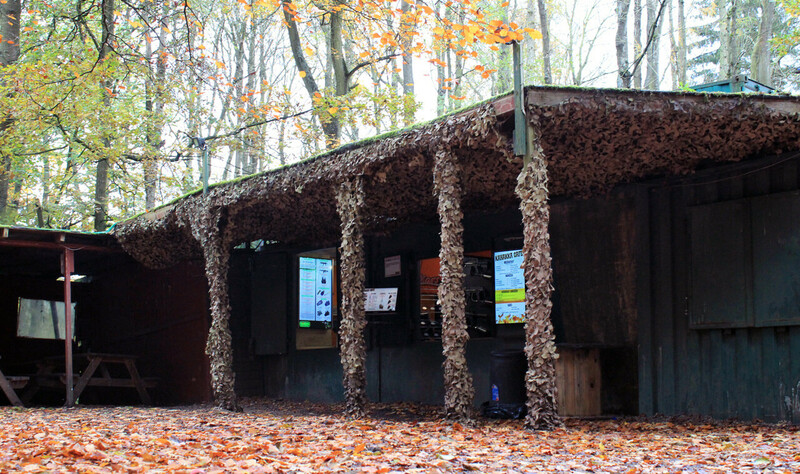 With the business expanding, Knowsley Safari needed a Digital Signage solution that would act as a wayfinding tool as well as delivering key, up-to-date information. 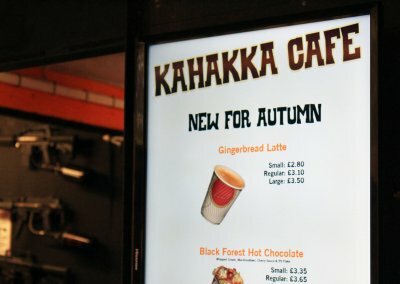 Static signage was becoming too costly and time consuming to change. 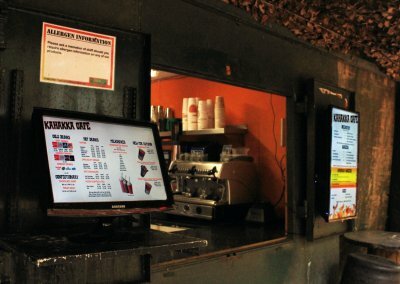 An outdoor touch screen solution would provide the option of updating efficiently with real time information. 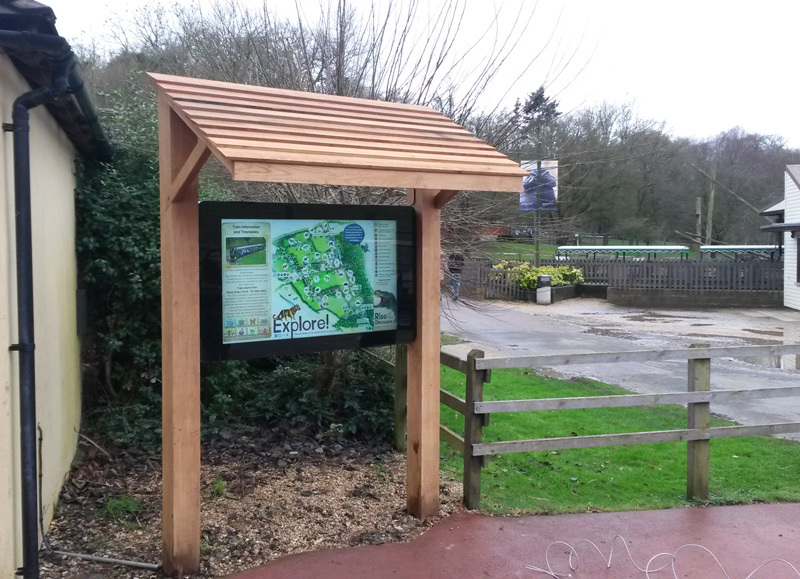 Eclipse Digital worked with Knowsley Safari throughout the entire project and supplied a the 55″ high-bright outdoor capacitive touch digital signage display, ONELAN digital signage player and paired with the cloud based digital signage software embed signage. 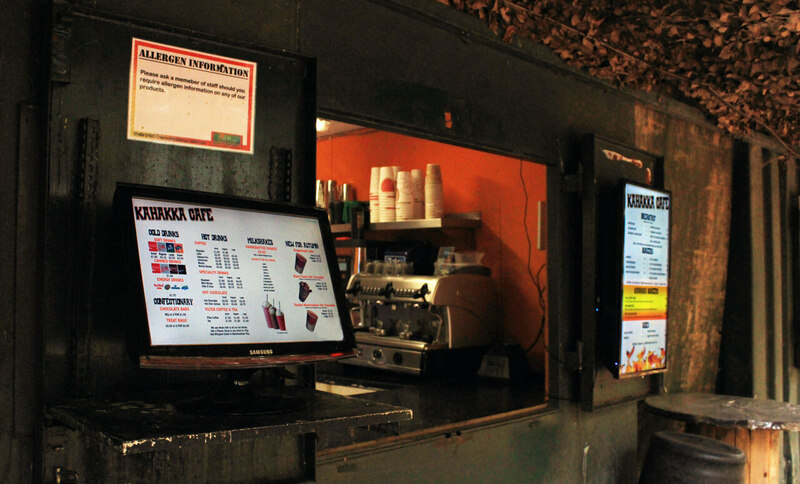 “There were many companies looking to provide us with our first touchscreen. We decided Eclipse Digital Media because of their competitive pricing together with friendly client services and a simple operating system.”. 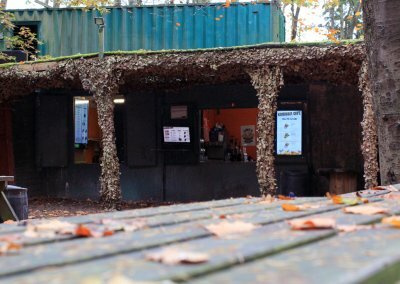 Marwell Zoo, (formerly Marwell Zoological Park) is a 140-acre zoo and registered charity situated at Hampshire, UK. It is home to over 170 exotic and endangered species and situated in beautiful, landscaped surroundings. 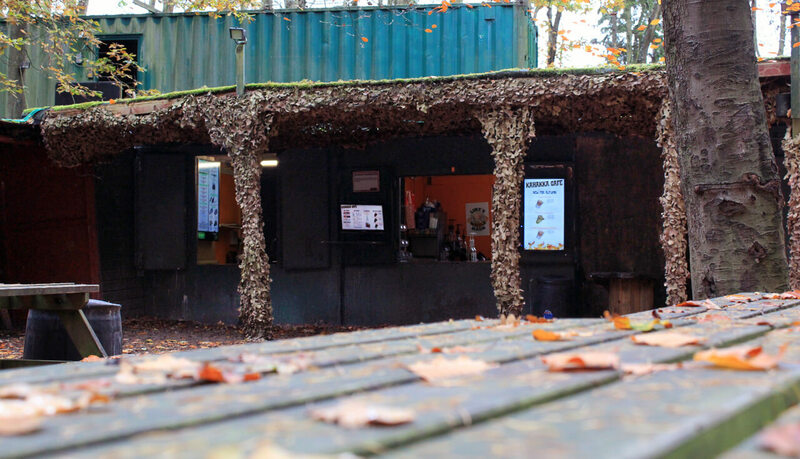 Beyond the park itself, the Marwell Wildlife charity works for international conservation, with a particular focus in Africa. 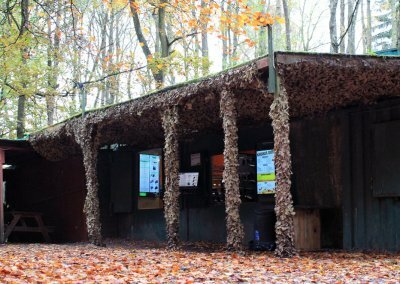 The name of the park was changed from Marwell Zoological Park to Marwell Wildlife in 2009 to promote these wider activities. 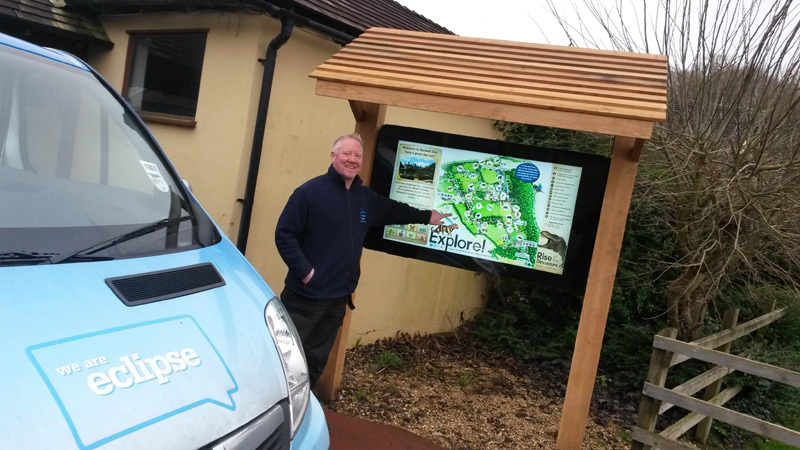 Marwell Zoo wanted a new interactive way to engage with its visitors. 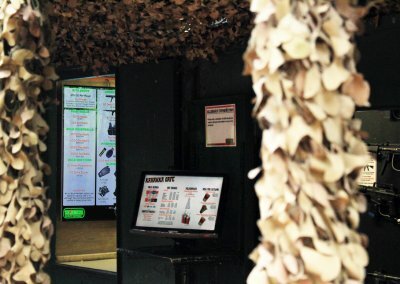 They had an abundance of information they wanted to communicate to visitors and found printed media was limiting. 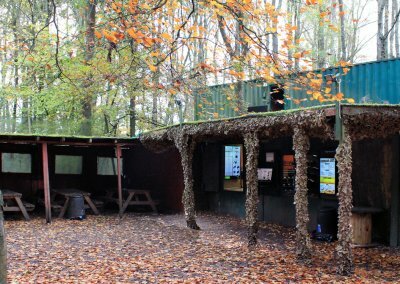 They tasked Eclipse Digital with providing suggestions of ways to engage and communicate more effectively with the park visitors all year round. 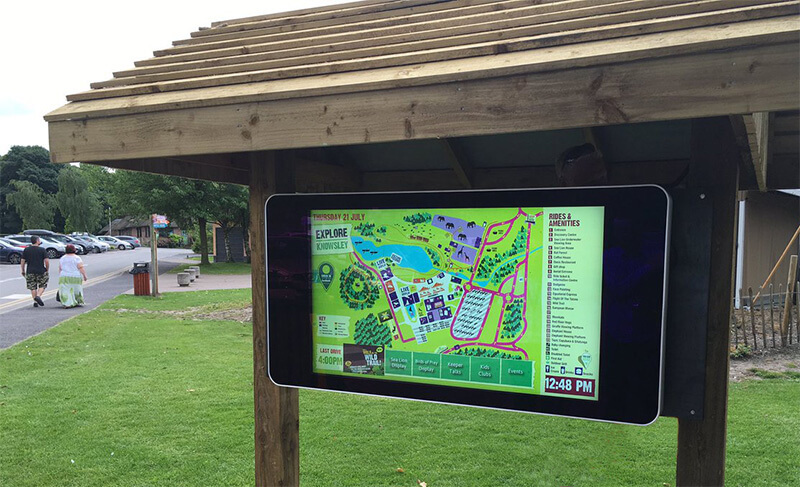 After evaluating various options, Eclipse Digital provided an outdoor interactive wayfinding solution. 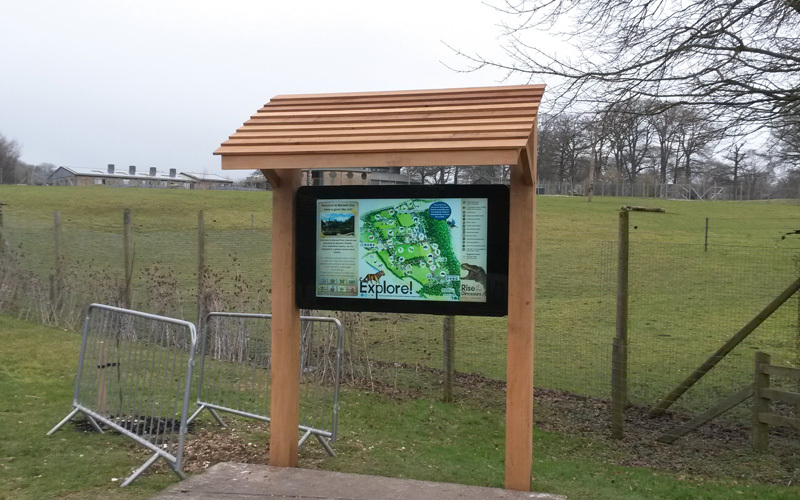 This outdoor wayfinding solution was composed by Eclipse Digital using an industry leading IP66 rated capacitive touch enclosure, from Harp Visual, a Samsung high-bright commercial grade panel and a ONELAN digital signage content management network. 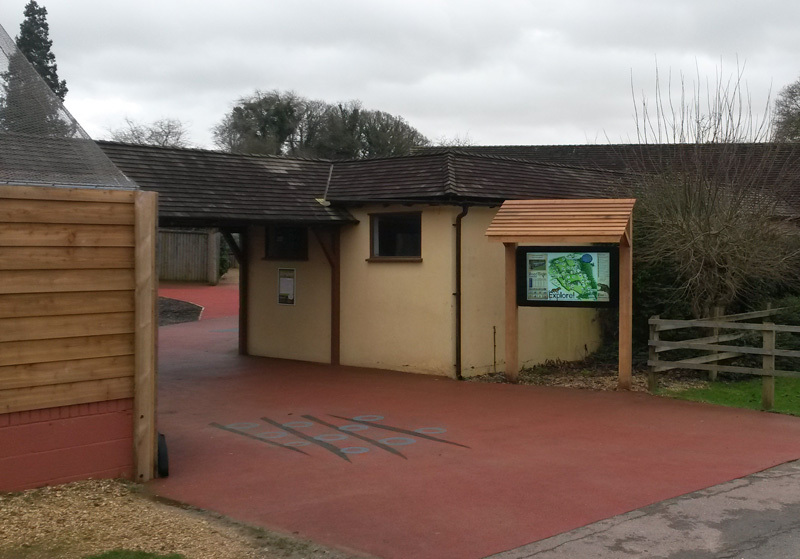 This was then built onto a beautiful timber framework from outdoor furniture and sign specialists Fitzpatrick Woolmer. 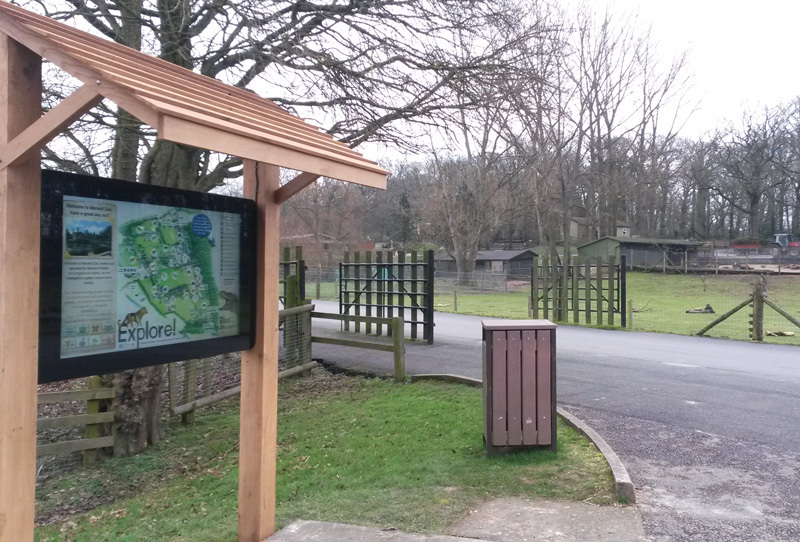 The map design allows users to explore the park and touch the animal sections to discover key information about them. 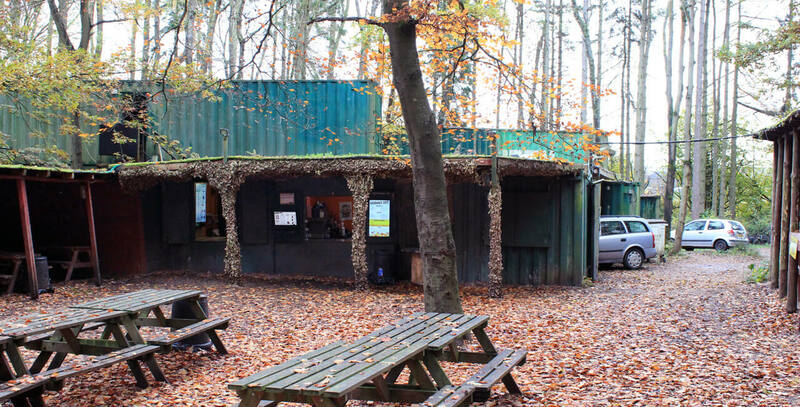 There are several other areas on the map to discover including, upcoming events, details on becoming a member, talks around the park and general information on where to eat, shop and the location of the facilities. 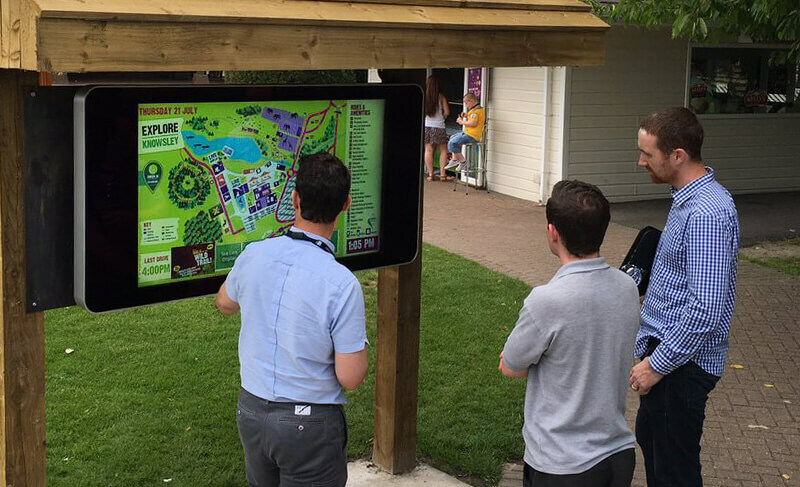 All content can be updated by Marwell’s in house marketing & events team providing them the flexibility required to engage with their visitors and communicate important information in an effective and simplistic manner.